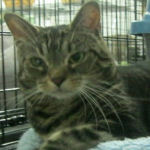 Scout - declawed 4-6 year old female. Her one eye is not good but she does fine with her other eye. Scout was returned because her owners got a dog and Scout didn't like the dog. Even though Scout was there first, she got returned. She is patiently waiting for her forever home. NO DOGS, please.